An 18 mile long peninsula protrudes in a northerly direction splitting Grand Traverse bay into east and west arms. Sitting on the 45th parallel and sheltered from major winds by the east and west points of the bay, the area had long been home to bands of Ottawa, who took up permanent residence on the narrow peninsula, planting potatoes and corn, and tapping the maples for their sweet sugar syrup. In accordance with the Treaty of 1836, the Federal Government agreed to provide the natives with both a mission and schools for their reservation, and on behalf of the federal government Henry Schoolcraft selected a natural harbor on the eastern shore of the peninsula for the planned facilities. Dispatched by the Presbyterian Board of Missions, the Reverend Peter Dougherty arrived in the harbor in 1838 to establish the mission for which the peninsula would eventually become known. Word of the excellent growing conditions in the area around Grand Traverse Bay spread, and increasing numbers of settlers began moving into the territory to stake their claim. As was so often the case, the Federal Government reevaluated the old treaties, and determined that the Indian lands around the bay should become public property. With the organization of Grand Traverse and Peninsula townships in 1853, yet more settlers moved into the area to take up farming, and both arms of the bay were soon busy with vessels arriving to ship produce to the growing cities on the southern shores of the lakes. With shoals projecting two miles from the northernmost tip of the Old Mission Peninsula, mariners making their way south into Grand Traverse Bay had to exercise great caution in navigating around the peninsula when making their way into either east or west arm of the bay. Responding to a call from the maritime community, Congress appropriated the sum of $6,000 to establish a light on Old Mission Point on March 3, 1859. However, with the onset of the Civil War, the establishment of the station understandably took on reduced priority. With an increasing number of requests for the establishment of lighthouses throughout the Great Lakes, in 1863 the Lighthouse Board appointed a committee to conduct a review of recommended sites to report on the relative merits of each. Assigned to evaluate the site at Mission Point, Colonel James D. Graham of the Army Corps of Engineers reported that "there is an extensive trade in the two arms of this bay, the coasts and back country of which are thickly settled. At the heads of both these arms there are excellent harbors and good anchorage, and vessels should be aided in reaching them." With the end of the Civil War, and the country’s economy slowly improving, a site for the light on Old Mission Point was finally selected in 1869, and negotiations were underway with the owner to obtain clear title to the reservation. Work on the new station began on the opening of the 1870 navigation season. Plans for the station called for the erection of a 1 ½-story timber-framed dwelling with a short wooden tower integrated into the lakeward gable end. The tower was capped with an decagonal cast iron lantern, and stood 36 feet tall from the foundation to the top of the ventilator ball. Outfitted with a fixed white Fifth Order Fresnel lens, the structure’s location on a sand bank fourteen feet above the water’s surface provided the lens with focal plane of 47 feet, and was visible from a distance of 13 miles at sea. Jerome M. Pratt Sr., who had been serving as First Assistant at Skillagalee Island since 1861 was selected as the station’s first Keeper. After arriving at Mission Point on September 3, Pratt moved his belongings into the new dwelling, and officially exhibited the new light for the first time on the night of September 10, 1870. After seven years, Pratt was removed as Keeper at Old Mission on January 30, 1877, and replaced by John M. McHaney, who was likely only to willing to accept a transfer to the bucolic setting of Old Mission from the isolation of Waugoshance Shoal where he had been serving as Keeper since 1865. Life at Mission Point appears to have been relatively uneventful, as little mention of the station is made in official Lighthouse Board documents, beyond relatively minor maintenance and repairs being conducted on an almost annual basis until 1880, when a work crew arrived to excavate a cellar beneath the dwelling, and completely repainted the station inside and out. 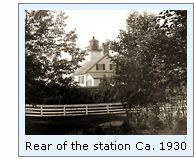 Keeper McHaney did not get to enjoy the improvements at the station for too long, as he passed away on August 15 of the following year. John W. Lane, who was serving as 1st Assistant Keeper of the St. Clair Flats South Canal Range Lights was promoted to the position of Acting Keeper of the Mission Point Light, arriving at Mission Point with his wife Sarah after making the long trip from "down state." Evidently District Inspector Commander J. Crittenden Watson was pleased with Lane’s performance, as he was officially given full Keeper status on June 19, 1883. With rising lake levels in the late 1880’s erosion was threatening the sand bank on which the station was erected, and a crew arrived at Mission Point in 1889 to erect a 200 foot long timber revetment was erected in front of the dwelling, and filled with stone to help stave off further erosion. While on site, the crew also installed a brick cistern in the cellar. The downspouts from the dwelling roof were equipped with diverters, allowing runoff from the roof to flow directly into the cistern or to be diverted onto the ground. On completion of the installation, a pump was installed at the sink in the kitchen and plumbed so as to draw its water from the cistern. In practice, the keepers kept the diverters closed so when rain came they would allow the rainwater to clean the roof for a period of time before opening the diverters to allow the water to enter the cistern. While to our twenty-first century sensibilities, the practice of drinking and cooking with water that had run from the roof sounds disgusting, it was a commonplace practice at light stations in the late 1800's. Oil for the lamp had been stored in the cellar since its installation beneath the dwelling in 1880. The sperm or lard oil used for this purpose was relatively non-volatile, and this had become standard practice throughout the lighthouse system. 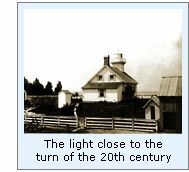 However, with a change to the significantly more volatile kerosene, a number of devastating dwelling fires were experienced, and beginning late in the 1880's the Lighthouse Board began building separate oil storage buildings at all US light stations. To this end, materials for the erection of an oil storage building at Mission Point were ordered at the lighthouse depot in 1897, and with the delivery of the materials and a work crew at the station in 1899, a 360-gallon storage building was erected to the rear of the dwelling. With increasing numbers of vacationers visiting Mission Point at the turn of the twentieth century, 198 feet of tight board fence and 344 feet of wire fence were erected around the station in 1901, and 350 feet of plank walkways were installed connecting the station structures. Keeper Lane passed away on December 12, 1906, and his wife Sarah was appointed as acting Keeper to replace him. Sarah likely found tending the light to be too filled with memories of her late husband, as she resigned that following March, to be replaced by sixty year old James Davenport on March 13, 1907. Davenport entered lighthouse service in 1871, and had served at Waugoshance and Little Sable before accepting the Keeper’s position at McGulpin’s Point Light in 1879. 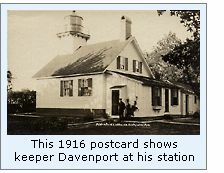 Davenport had established a reputation at McGulpin’s Point, and had become a well respected member of the Mackinaw community, and would likely have lived out his service years at McGulpin’s Point were the station not closed down in 1906, and thus accepted the transfer to Mission Point. William F Green transferred-in from South Fox Island, and James Davenport returned to Mackinaw City, where he lived-out the remainder of his life, passing away on March 18, 1932 at the age of eighty-five. Evidently Green missed South Fox Island, as he accepted a transfer back to the station in 1924, and the search was on for yet another keeper at Mission Point. Emil C. Johnson accepted a promotion to Mission Point from Grand Traverse Light, where he had been serving as First Assistant since 1916, arriving at Mission Point on June 27, 1924. 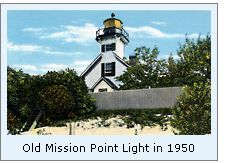 After sixty-seven years of service lighting the Point, plans were under formulation which would eliminate the need for the Mission Point Light. Since the station had been established to mark the shoals off the point, improvements in offshore construction and automated lighthouse illumination had come together to allow the erection of an offshore navigation aid to directly mark the shoal itself. Thus, in 1938, work began on construction of a pier for the new light in 19 feet of water, approximately 1 7/8 miles northwest of Mission Point. The pier was made up of a circular pier of interlocking steel piling with its center filled with stone and concrete. Atop the pier deck, four concrete cylinders were poured as a foundation for a 36-foot tall skeletal steel pyramid tower. Topped with a 200 mm lantern, power for the lamp was supplied by a 330 candlepower electric light with its power provided by a rank of batteries. In order to conserve energy, and therefore reduce the frequency at which the batteries required recharging, the light emitted a single white flash every ten seconds. With a focal plane of 52 feet, the new unmanned light was visible for 13 miles at sea. At some time over the intervening years, the skeleton tower was removed from the crib of the new light, and replaced by a cylindrical D-9 type tower outfitted with a solar powered acrylic optic. 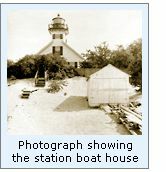 The State of Michigan purchased the old lighthouse property after the Second World War, as part of a new park. The dwelling is maintained by Peninsula Township, and is used as a residence by park employees. While the dwelling and the lighthouse grounds themselves are closed to the public, the area on all four sides of the old station are open to the public, as is the beach in front of the lighthouse. 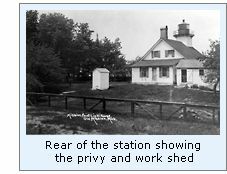 Click Here to see a complete listing of all Mission Point Light keepers compiled by Phyllis L. Tag of Great Lakes Lighthouse Research. We headed up Mission Peninsula with Sue's Folks. We were amazed at all the wineries and grape groves that had sprung-up since we last visited the peninsula some 20 years before. The lighthouse, which is currently a private dwelling for the Park manager, is surrounded by a wooden fence, which is unfortunately obtrusive when viewed from the lake. We walked the beach to the East of the point, and saw lots of shore birds. To the West of the Point, there was a small rocky island with a fairly new sailboat smashed against one side. I could almost hear the blinded lighthouse chuckling! Take M37 North up the Mission Peninsula approximately 16 miles to the road's end at the lighthouse parking area. Walk through the trees alongside the lighthouse and onto the beach. Annual reports of the Lighthouse Board, various, 1862 - 1909. Personal observation at Old Mission, 09/07/1998.